Think you have to use strong scents, and chemicals to get your bathroom clean? Think again! There is a better way. We’re all about making cleaning easy, affordable and chemical-free, that’s why we’re sharing our favorite homemade bathroom cleaning recipes. We promise that you can make your bathroom sparkle, shine and smell fantastic without harsh chemicals! Whether you want to see your reflection in those shower tiles or need something powerful to take on the dreaded toilet, we’ve got you covered with these amazing homemade bathroom cleaners. These are just some of the basics you’ll need to get cleaning, but make sure to follow the homemade bathroom cleaning recipes below and get scrubbing! 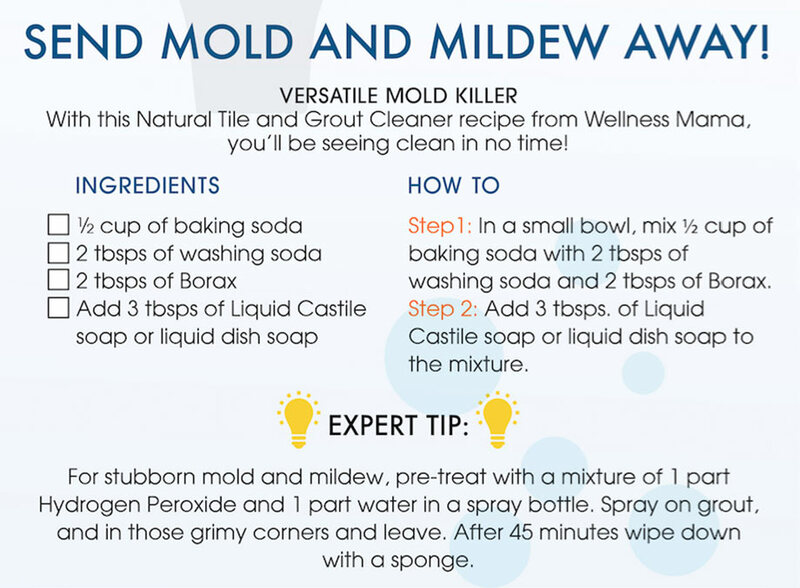 Send Mold and Mildew Away! Think mildew, mold and rust stains can’t be cleaned with a natural, homemade bathroom cleaning product? With this Natural Tile and Grout Cleaner recipe from Wellness Mama, you’ll be seeing clean in no time. In a small bowl, mix ½ cup of baking soda with 2 tbsps. of washing soda and 2 tbsps. of Borax. Add 3 tbsps. of Liquid Castile soap or liquid dish soap to the mixture. Then sprinkle the mixture on the tub and let sit for 15 minutes. Now you need to get scrubbing. With a heavy-duty brush and some gumption, tackle that dingy grout, then rinse clean. ***Expert Tip: For stubborn mold and mildew, pre-treat with a mixture of 1 part Hydrogen Peroxide and 1 part water in a spray bottle. Spray on grout, and in those grimy corners and leave. After 45 minutes wipe down with a sponge. We couldn’t live with ourselves if we didn’t share this DIY Homemade Bathroom Cleaner from Live Simply. It’s simply amazing! This organic, homemade bathroom cleaner will soon become your go-to cleaner for everything in your bathroom! Make a big batch and store under your bathroom sink for those quick and easy cleaning jobs. Here’s how to do it: First, add 2 cups of warm water in a spray bottle. 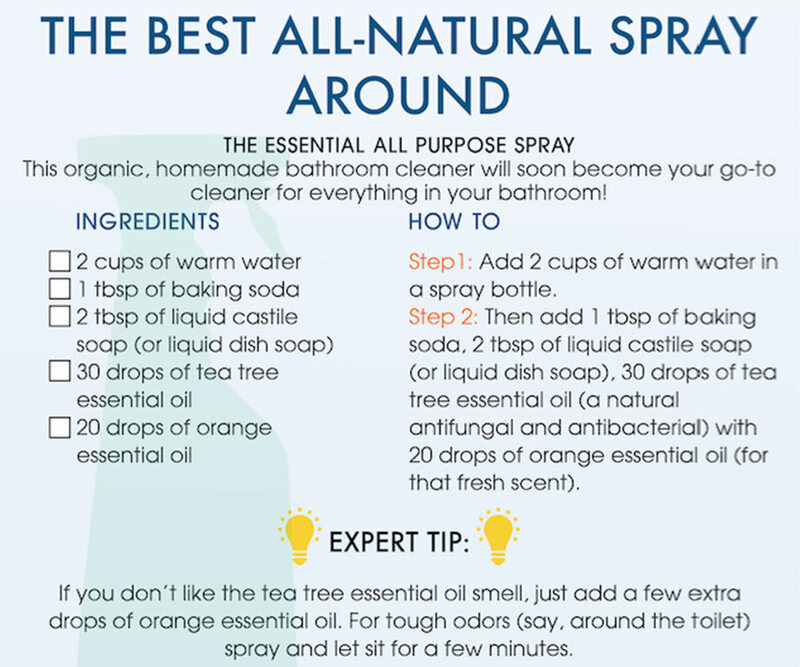 Then add 1 tbsp of baking soda, 2 tbsp of liquid castile soap (or liquid dish soap), 30 drops of tea tree essential oil (a natural antifungal and antibacterial) with 20 drops of orange essential oil (for that fresh scent). Spray everywhere and anywhere you want clean. Works well on walls, countertops, sinks, and floors. Just spray, leave for a couple of minutes and wipe away clean. ***Expert Tip. If you don’t like the tea tree essential oil smell, just add a few extra drops of orange essential oil. For tough odors (say, around the toilet) spray and let sit for a few minutes. Mirror Mirror on The Wall! Can We Clean You Without Streaks? Take care of those messy fingerprints in no time with this homemade – streak-free – glass cleaner recipe from Whole New Mom. The secret to this streak-free concoction is the addition of cornstarch. Why does cornstarch reduce the streaks? Here’s how: If you look at glass close-up (like microscopic level) you will notice that there are many bumps and ridges – it’s not completely smooth. 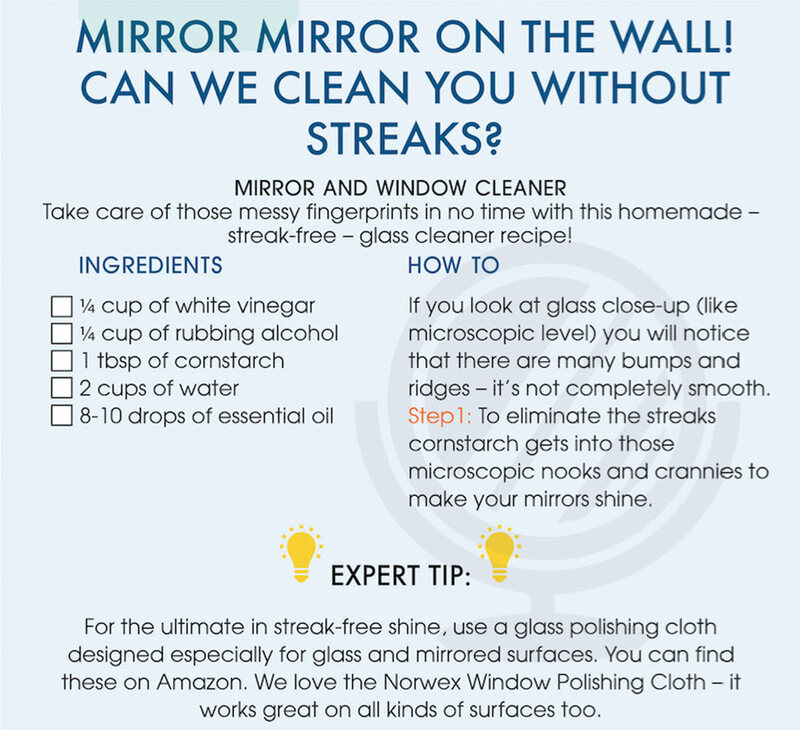 To eliminate the streaks cornstarch gets into those microscopic nooks and crannies to make your mirrors shine. Here’s the recipe: Add ¼ cup of white vinegar, ¼ cup of rubbing alcohol, 1 tbsp. of cornstarch, 2 cups of water and 8-10 drops of essential oil in a spray bottle. Shake well before using. If you have an allergy to corn, Whole New Mom suggests using arrowroot powder instead (which should work just as well). Spray on mirrors, or windows and wipe clean. And notice the streaks? No. We didn’t think so. *** Expert Tip. For the ultimate in streak-free shine, use a glass polishing cloth designed especially for glass and mirrored surfaces. You can find these on Amazon. We love the Norwex Window Polishing Cloth – it works great on all kinds of surfaces too. Why would you want to spray chemicals that just mask odors when you can freshen your bathroom air continuously with this Homemade Air Freshener recipe from The Homemade Experiment? We love mixing this up in a decorative mason jar and placing it above the toilet where odors can always lurk. Just shake up your favorite essential oils (lemon, lavender or orange) with a cup of baking soda in a mason jar. Be sure to shake the mixture well to wake up those oils. Leave anywhere you need freshening! Think you can’t take on the dreaded toilet with all-natural, organic cleaning products? Think again. Ditch the chemicals and get your porcelain gleaming with this easy-to-make Heavy Duty Toilet Formula from DIY Natural that helps eliminate those pesky toilet odors. This homemade toilet cleaner takes a little time to work effectively (you can let it sit overnight), but it’s super easy and really effective. Just mix ¾ cup of Borax, 1 cup of white vinegar, 10 to 15 drops of your favorite essential oils, like lavender or lemon in a squirt bottle. Flush the towel bowl first to wet the inside and pour the entire mixture into the toilet bowl. Allow it to work by leaving it for a few hours, or overnight. In the morning, simply scrub the bowl clean and flush away those hard water stains. It’s that easy! We hope you’ve had fun taking on one of the busiest rooms in your home. These were just a few of our favorite, easy-to-use, effective homemade bathroom cleaning recipes. Here at Neato we’re all about making your life easier and chemical-free with smart cleaning solutions. Keep following our blog for more expert cleaning and household management tips. We love your home as much as you do!